This was not a really a computer but rather a wordprocessing system. The full-text monitor could display 70 lines of 102 characters. The text could be black on a white background, or the inverse. Two 8" disks (600 kb) stored the files. Each disk catalog could store up to 560 files. The system was sold with a Diablo printer, which was bidirectional and could print 40 characters per second. Up to three Xerox 860 could share one Diablo printer. The printer spooler could store up to 20 documents waiting to be printed. 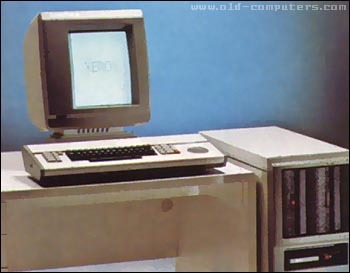 The Xerox 860 could also be used to write and send electronic mails or work with data-bases through an Ethernet network. There was another version called 'Supertext' which was the same system but with a smaller screen (24 x 102 characters). These kind of systems were very expensive! The 860 really was a computer! Its innards had all the bits defined as needed to be a computer, and with the correct floppy disk set, was capable of executing programs written in BASIC. I used one of these in the Navy in the early 80s. I sold these systems in the late 80s, just as they were being made obsolete by laser printers and PCs. Xerox invented or developed most of the technology that, in the hands of others, put it out of business. This includes the laser printer, the graphical user interface, and the mouse! Sadly, the copiers-heads who ran the company never understood the microcomputer revolution. For a present-day counterpart, see Motorola's sad decline under the direction of the founder's son. I learned to use the Xerox 860 while I sold at Xerox. What a computer! I could even do spread-sheets done on the earlier 16-8 and 820II systems on the 860. Everyone liked the full page screen, the black on white display and the CAT. Yes the fore-runner of the mouse. The Capacitance Activated Template, that moved the cursor around the screen. Laptops today use this technology. We replaced a lot of AES systems with the Xerox 860. They were very productive. A number of us at Xerox got the machine to use at home. We ran VisiCalc on the CPM o/s. I couldn't beleive it when I created an automatic spreadsheet that would do our monthly expenses. We printed out the result on a 5 part form. Lining it up so the Diablo would print correctly in the fields took some time. We use this for a couple of years. YES, Ethernet as early as 1983. This would use the Xerox Network Systems (XNS) protocol and connect to Xerox file servers, printer servers, mail servers and even communications servers. see more Xerox 860 Ebay auctions !